It was the best umbrella at the parade. 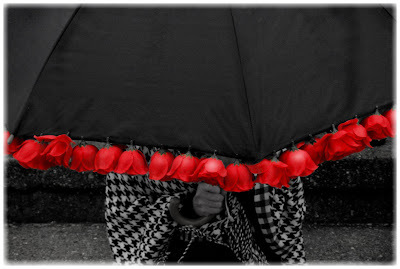 When God gives you rain, cover yourself with roses. I am fighting (with very little success, I might add) my annoyance with this continuing rain. I like my rain to stop every once in a while. I considered making a list of all the good things about this rain: 1. The lovely, lovely Katie thinks it may possibly (she's not sure) bring redder leaves to autumn, 2. the quite enchanting fog that settled in for a bit this evening, 3. . . . 3. . . . and here I become stumped, and since really, 2 things can't make a list, can they?, I have no list. I would so love to say that I feel all cozy in my house with the rain coming down outside, but I don't - not after this many days (or is it weeks?). Perhaps if I had more windows and more light could peek in, gray though it might be, perhaps that would help. Perhaps. Perhaps if I didn't have to brush against almost knee-high wet monkey grass every morning to climb in the Jeep, which has begun to be quite icky and aggravating, perhaps I would feel better about it all. Perhaps if the rain would stop just long enough for me to take out the trash without getting wet, perhaps if my key would just stop sticking in the front door lock while I stand with purse & tote & camera over my shoulder, umbrella held over my head, loudly cursing while trying to finesse the key back out and avoid the biggest fattest raindrops of all that fall in that exact spot, drops that fall from the roof at that exact moment, working their way under the umbrella which I cannot keep quite straight as I fight with the lock, demanding it give back my key. Eventually it does and I throw my stuff in the Jeep from the passenger side before heading for my side and that waiting, wet, evil monkey grass. I am in a bad mood before I leave the yard. Perhaps if all that were not a daily occurrence, it would help. Perhaps. But right now, the leaves on the ground are not red - they are green and yellow and mostly brown-going-to-mold and they are wet and they stick to the bottoms of shoes and I find them all over my house. Inside my front door there are 4 or 5 pairs of flipflops and a pair of boots and I change from one pair to the other as I go in and out, but the cat doesn't wear shoes, and even if she did it wouldn't matter - the leaves stick to her tail and her back, and they cling to the doorjamb and find their way in no matter what I do. I can't sweep them - they are wet and hold on tightly to the broom, so I must pick them up one by one, or wait until they are dry and then sweep. I am not too proud to admit there are days I do just that. This. Yes, this one. This is my very favorite photo. Ever. Ever, ever, ever. what is up with this ? love you photo...ready for sun though! what a great shot - such a fun and cheerful umbrella. i am with you on all this rain. i kept shaking my head "yes" "i know!" as i read your words. although we do have a gorgeous day today : } we've had our share of rain, more to come tomorrow through the rest of the week. Love the umbrella done up! Clever as you always are. Sigh...I wish we had some rain here. Relyn - I know where these umbrellas can be found . . . LOL! You are too kind and I love you dearly. elk - They're saying this weekend. I hope they're right! SYW - It is making me crazy. I am developing cabin fever. :) But, as elk pointed out to me, it could be worse, and it is for many people. I am oh-so-thankful for no flooding. The umbrella is cheerful, isn't it? It made me laugh on such a dreary day. Paula - I know. I will be upset when we go too long without rain. Either/or, huh? Oh, that evil monkey grass. Would you like me to come over and fight it off with my sword? Here's number 3...if it weren't for the rain you wouldn't have captured that wonderful wonderful umbrella picture!!!!! Hang in there...it can't rain forever. Love the umbrella and understand about the rain. It has been cold (high in the mid 40's), rainy, gray, and dreadfully icky all week. Supposed to see the sun this weekend....we will see. Hugs to you! oh that photo!! just the slightest peek under the front i love that...and that herringbone black &white poncho or whatever it is..! quite incongruent with a Texas parade in my narrow mind. it looks like it should be worn on fifth avenue. worn over a starched white shirt and black wool pencil skirt accented with very, very pointy and tall high heels on a women who is taaaallll and has shapely calves. I mean then the poncho would look elegant. i think. i can't feel too sorry for you with the rain. i'm sorry but i live in the pacific north west. we know endless rain and gray and dull and dark. you mentioned in your fabulous red post that red umbrellas cast a beautiful light on the face. i am going to buy myself a red umbrella. i would love to close my eyes and feel that warmth and beauty on my face :) i will try that!